i am going to try and post pics of the gifts the fosters got in the mail. but for some reason, I always seem to have trouble. I just want to say thanks for the generosity!! These gifts are awesome!! OH!!! Shelly also donated to Max's you caring fundraiser!! One more gift came today, but I don't know who sent it, no packing slip was inside, but Lacey got herself her very own, brand new crate!! She has already slept in it! so this week has been A M A Z I N G for gift for the babes. and I can't thank everyone who got something for Lacey and Max 2!! You are all angels in our eyes!! WHEW!! I think that's everything, ifIi missed something or someone please let me know. i do want to thanks everyone. I try to save all the paperwork that comes in the boxes, but sometimes it does'nt come with anything. I tried to take a picture with Lacey and her gifts, but she was less than cooperative. she doesn't sit still!! Max was sleeping outside!! We took Neiko to the vet tonight just to check up on his eye. The vet thinks it looks good and we just have to continue with the same routine! He was such a good boy at the vet that we took him to Petco for a little present when we were done. Here's the pictures from his trip today! This is Rosie's favorite toy. It is not to be harmed. She will just suckle on it until she falls asleep. It is so sweet. Max's cozee cone arrived today. Thanks so much to Jodi Groff for sending that for Max. So???? How does he look????? Happy First Gotcha Day Jax! 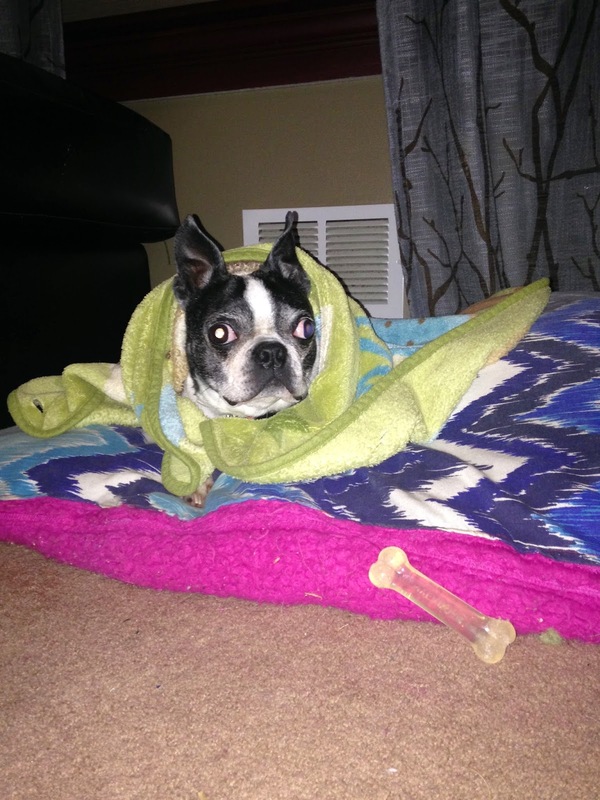 I sat down one day to write a letter to my former foster, now fully owned Boston Terrier - and possibly Frenchie - Jaxx, a letter. Then I got an anniversary card in the mail and realized I wrote it to share with everyone. So here it is. You are a funny little dog, you know. 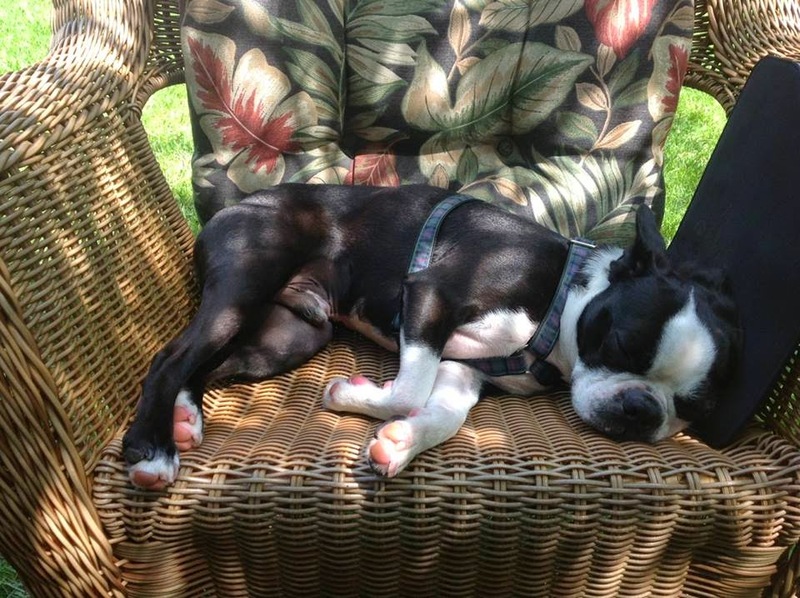 You are my first male Boston so you are a bit special to me. You haven't always been so nice, but I have always been consistent, and loving, and patient. Deep down, I knew you missed your first life, but life changed and you needed to move on. Your next stop didn't work out for you possibly because you were sad, so I took you in temporarily. And you were sad, and mean, and didn't necessarily like your foster sisters....at all. I knew you didn't really like us much at first either. But I know that love wins out in the end so I stayed loyal and consistent. I knew you didn't give kisses even though I asked, I knew you didn't really like chewing bones, but I gave them to you. Sometimes I just left you alone to watch your sisters and you started to learn to be a happy dog again. I also knew, no matter how sad or grouchy you wanted to be, the sun would cure it all for you. So we taught you the doggy door, put an extra bed on the porch and you stayed in the sun all day when you could. And I saw you start to relax. Remember when you would only go as far as the big plant to pee when you had a whole yard to roam? Sometimes you made me sad, just thinking how sad or scared you were. And then there was the time when you scared the vet techs and they put something in your chart and everyone was afraid of you at the doctors. Until we met the doctor in Florida who looked at you, scowled and said, " quiet Jaxx, your getting your nails cut" and he just cut them. At first you had your special chair or place to sit and you would just stay there when we left the house. But it was when we left you alone with your sisters that things started to happen. Like that time we found you all together in the beds, sleeping? Or the time you ran down the stairs for the first time because you were happy I was home and you'd run to me, then walk away. I was so happy for that little recognition. I don't remember how or why it happened, but one day daddy took you to work in his truck, and there it was, you found your happy. And you go to work everyday and daddy loves it as much as you. You loved following daddy all around, meeting the guys at work and going into the truck when you wanted to sleep ( secretly, the guys all told me about the amount of gas daddy uses to warm or cool the truck just so you can be happy and comfortable). You must have known how much you were loved , or maybe it was because you had one person all to yourself during the day. I don't know, but I could almost see your smile through your eyes a few months ago. Sometimes I watch you, sweet boy, and I watch how you smell around the whole yard, go in and out the doggy door, lay under the shade or in the sun on the porch. And it doesn't look like you want to be anywhere else- I was so worried for so long that we didn't do right by you. But we did, because love always wins in the end. Well, we have been through everything once, Jax, a whole year. fall, winter, spring and summer. We have been through a Christmas and Thanksgiving, New Year’s, a birthday ( that mom forgot! ), 4th of July, many trips to Florida and soon a trip to Maine. We have nothing but more of these good times to go through together and I can't wait. And your sisters even like you too! So, I'll end this by telling you a secret, Jax, and you probably have no idea, so here goes. The best thing that has happened to me this year started about a month ago, it is that little kiss you give me when I come home or walk in the door and you jump up to tell me to bend down to give me a little butterfly kiss on my lips. And for that Jax, I am deeply humbled and very happy. You love me too. Enjoy this little video of my guy... Happy Gotcha Day! They had told me that Buster Bear had to be chased down to get the ball back!!!! No more....I use the mini Kong balls that squeek so when I throw one ball I squeek another and he comes right back and drops it at my feet GOOD BOY BUSTER!! He's our newest foster, and needs some treats and toys! So won't you take a minute and send a bed or bone? for putting a smile on his face, and granting him his wish! Hi everybody! My name's Neiko and I'm the latest and greatest foster over at NEBTR! I'm super happy over at my foster mom Amanda's house! She just says I need a few things to seal the deal and make my stay a little more fun and comfortable! Would you be able to send me a little gift? I'll love ya forever! Jennifer has offered to donate some anti-itch skin soothing shampoo and creme rinse for itchy Miss Scarlett. She work for a veterinary distributor and have access to a number of brands of shampoo, and she is allowed to donate some to rescues. Thank you so much for thinking of Scarlett, Jennifer! Oh man, those are some cute toofs. What little blessings you have. That gorgeous Bella is still my favorite. 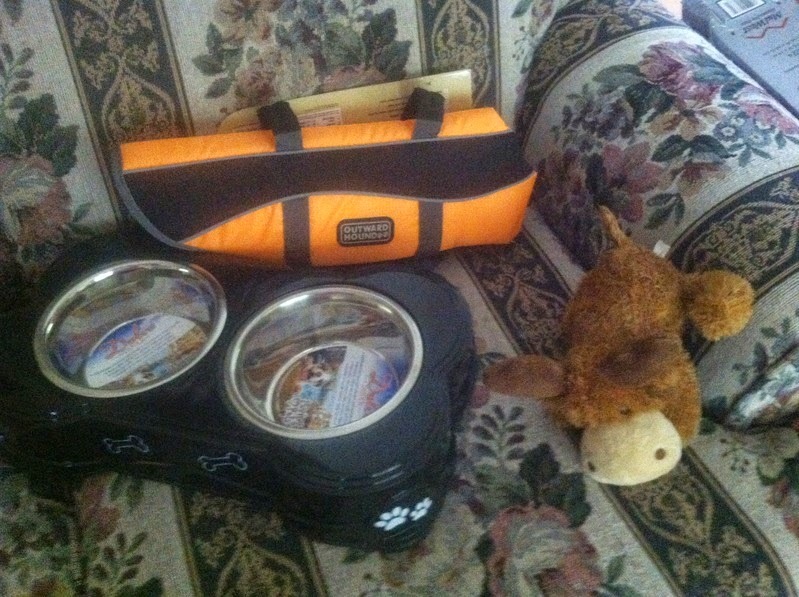 Caesar and I would like to thank Stacie and all who have made it possible for him to get these great gifts. He is enjoying them . Thanks everyone from Caesa. Neiko arrived to us on Sunday. So far, he is doing excellent here. He follows us all around the house and loves to be wherever we are. He is separated by baby gates in the house from our other 3 BT’s (Fenway 2, Ember 2, Gordon 4 months) They have been introduced on leashes outside and have seemed to get along that way. They are curious of each other between the gates, but not too curious. After sniffing they seem to not care/mind that the other is around. Overall I’d say he is doing well and adjusting to our home and us. Thank you so much Amanda McLean for opening your heart and home to this beautiful boy! Hi everyone! I made Ellie her new collar today. How fancy is she?! Amazing success! We had a minimum of 50 people, it was just Renata and I so thank God Carly Blake a new adopter and Producer showed up. 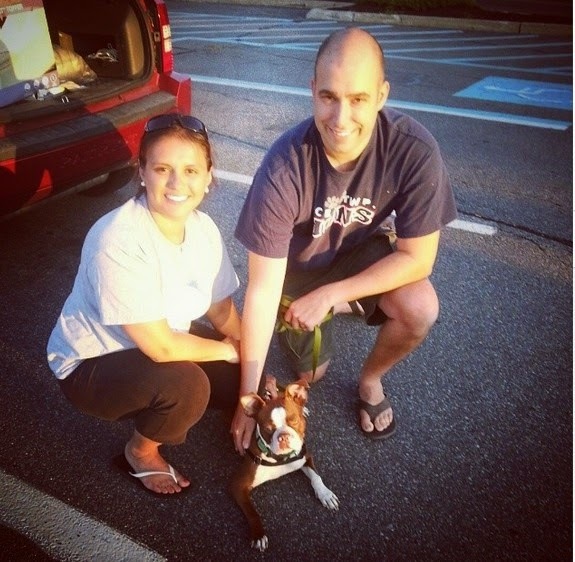 She just completed the adoption process for Roxy, she was able to tell people how the process works. We had people that traveled up to 1 hour to see BTs and learn how to adopt and volunteer. Carly filmed all day and will send us the video when it is complete. I have no voice left, I am a talker and I am even talked out! We picked up $42 in cash donations, and one woman is sending in a check. I will forward the $42 to Victoria this week. PET-VALU was incredibly hospitable and the day was wonderful. I baked tons of dog cookies and we had them as give-a-way, kids colored in boston terriers and we had black & white lolli-pops for the kids. It was fun and we will see what trickles in. 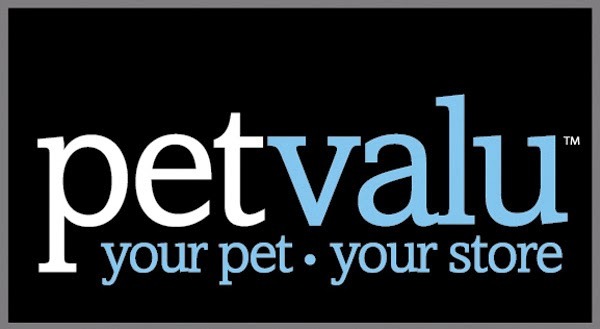 We have been invited back again, PET-VALU was thrilled at the activity. I told them I'd check back in possibly in September. Thanks team for allowing our family to be part of this incredible group! The thing I love the most, is no matter what happens, in the end, it's all about the bostons! Most excellent Maria! Now you are a pro at this stuff. So nice of you to devote your day to this. Not to mention all the prep time before hand. Thank you Maria for doing that, that's wonderful!!! This group is so blessed to have such wonderful people like yourself. 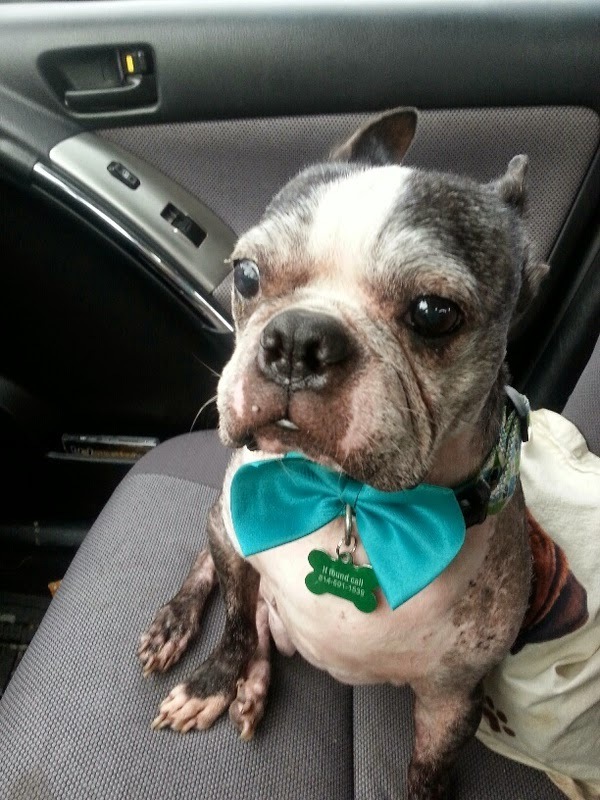 Thanks so much to Karen Kelsch for taking him into her heart and home! 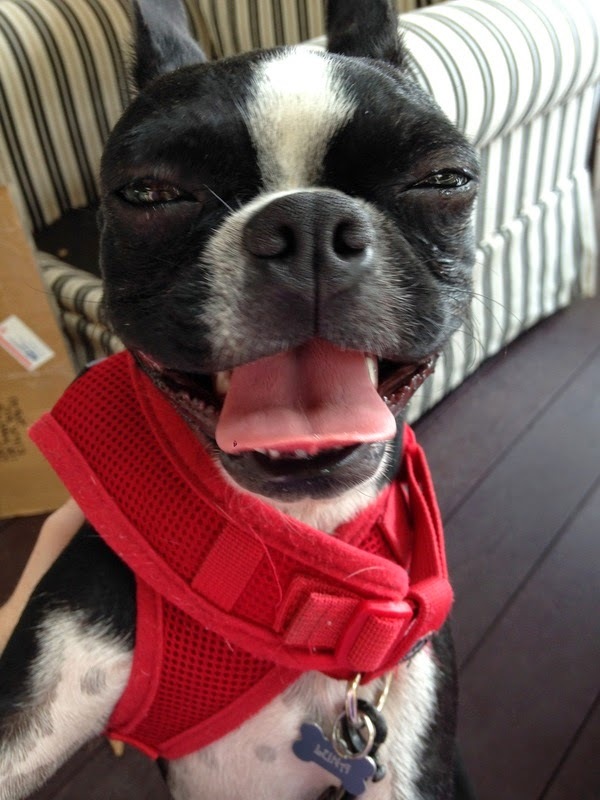 16 month limited edition brown boston terrier Adopted on June 24, 2014. Eat. Snort. Fart. Repeat. Little Miss Luna has landed. She is a very cute 20-pounder. She really does hate females though. I have her separated from my dogs, but the two times she was even near Tara, she became extremely aggressive. Poor Tara was shaking like a leaf. Papi doesn't bother her at all. Except for that, she should be easily adoptable. What a bunch of wonderful sponsors we have on Facebook. 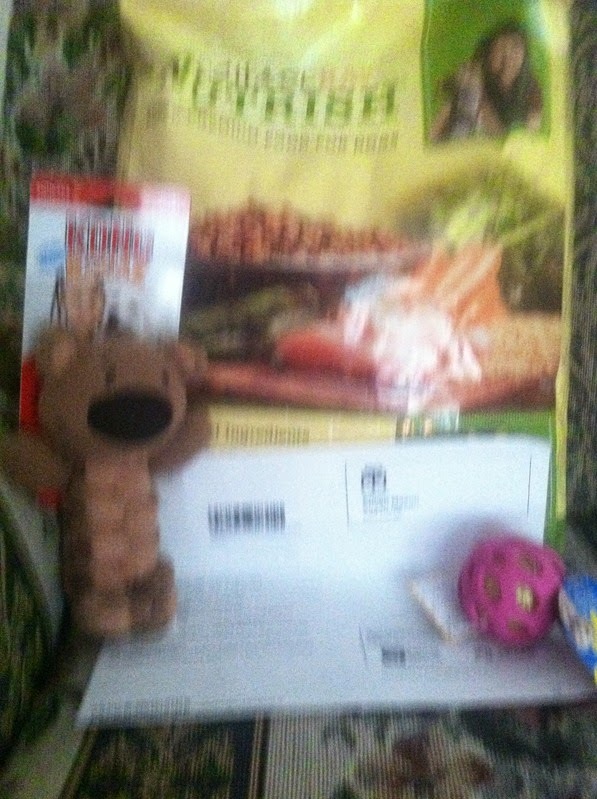 I only had Nylabones last week for the new foster packages, so we put a wish list together and posted it once last weekend. I travel all week and came home to this!! Are you kidding me? The room in my house where I keep all this is is very interesting to nosey BT's. I left the door open once and all 3 of them came out with something in their mouths...... I got to get pics, its a riot. There are so many wonderful, generous people out there!!! What a blessing!! We have the best NEBTR supporters!! Miss Remy loves sprinklers and hoses....kiddie pools not so much. I used the hose to fill up the outside water bowl and didn't let Remy have any fun with it. Here she is sulking waiting for the hose to turn on again. Also attached is a video of her playing in the sprinkler. It's all fun and games until she is done and then she looks all pathetic and shakes like a leaf. Poor girl! It's hot out so I thought I'd make you all Green T.
Caesar went for a ride today for his vet visit. He is a good boy in the car and the vet said all was good with him but he did try to chase the other dogs there . I think he just wanted to play . He definitely has a high pray drive . But we are working on that .All in all he is a great dog . He has a clean bill of health, and he is easy-peasy. Just a quiet, sweet, loving boy with a little playfulness on the side. He's like a wet noodle when you pick him up for a cuddle, and a great companion all-around. He was SO worth saving, and deserved all the generosity of this rescue group and its supporters!!! I think he'll be adoptable soon, if anyone is keen on a darling one-eyed boy. Only truth is, he has definite fear aggressive response. In normal, everyday home life, he's a gem. When we are in new environments, though, and around new people, he gets skittish, mistrustful, and even charges at people sometimes. No doubt he has reason to be mistrustful given his history. H e has small circular bald patches around his neck that makes me worry he might have been burned with cigarettes or something in his prior life. Makes me sad to think of that possibility. He'll need the right, deserving, perfect home, probably best with no kids under 10. I am madly in love with him, and he can stay with us as long as need be!! Thanks for taking him in and turning his life around. Yes, she likes it- maybe not head-over--heels, but she's game to give it a whirl..
Lacey is doing wonderful. She is getting along with all my animals and kids and hubby too! She loves to lay around and just be a part of what is going on. She eats well and is getting used to getting treats. She was very hesitent at first, I am wondering if she ever got treats before. She hasn't quite gotten the toy thing down yet, but that is something i am working on. 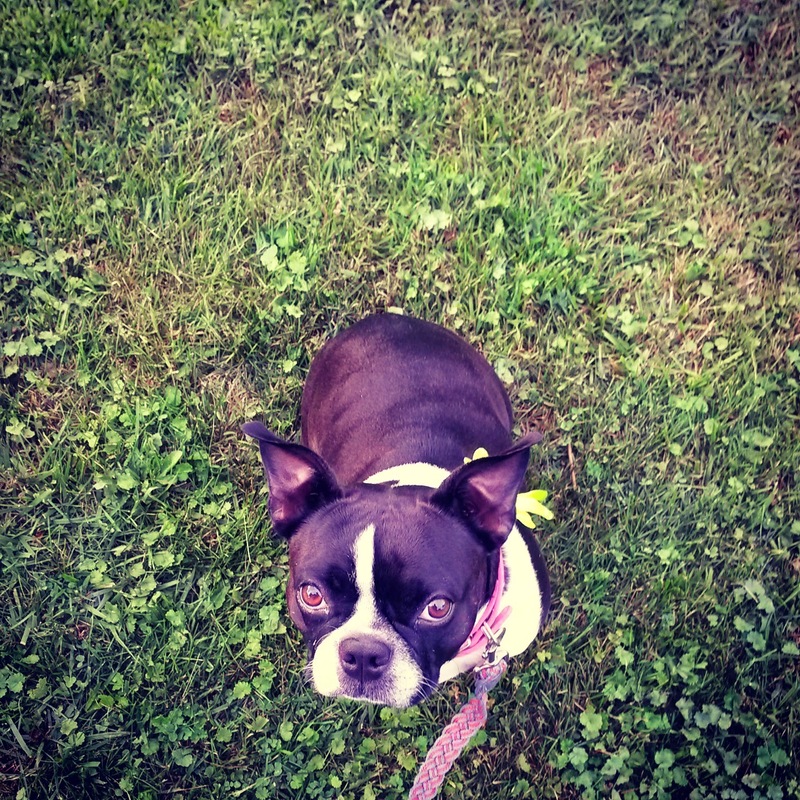 She loves to lay in the grass, as long as its not too hot outside. She is very good on walks and loves to go on them. She loves to give kisses!! She has a snore about her that ihave never heard before! its quite funny to hear. She has had a few accidents of peeing but thankfully she prefers the kitchen floor! !She doesn't give me any clues that she has to go so I am keeping a close eye on her and get her on a schedule. She has been a delight and very easy going and a joy t o have in my house. She is crate trained and doesn't mind being in there at night. During the day she generally has complete run of the house. She is VERY quiet and calm you hardly even know she is here. The results of her aspiration came back the other day, and it was decided by her vet, and victoria , sheryl and my self that we will not operate to remove the lump under her collar on her neck area. The tests came back inconclusive. And with her advanced age and heart murmur, it wouldn't be wise to put her under anestethesia. It doesn't seem to be affecting her at all so we will just watch it and make sure she is comfortable. So now its time to find her forever home! She will fit in anywhere!! By the time my son goes to bed I only have a very small window of opportunity to watch my "shows" before I start nodding off ha ha but Miss Remy doesn't care......she just wants to play! Remy's obsession with her Hartz Dura Ball hasn't waned. She carries it everywhere and won't leave her crate without it. Thanks again to Liz Fee for buying this for her off of her wishlist! I just love her little face. Rosie is 9 years young and so playful. What a joy she is. ... Rosie is protecting the house of an invasive species call "dog toys". She had been very successful. 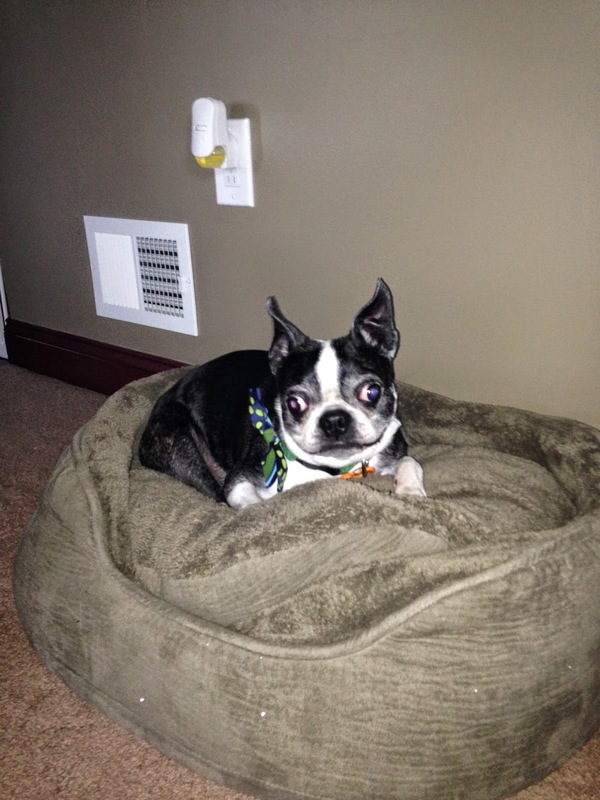 Just took Glory in yesterday, seven year old male, from Elmira NY. Glory's mom is in the hospital and will be going directly to a nursing home from there, a form of Alzheimer's called Loewy's Body Disease. Glory was her baby, has been kenneled since her admission and very depressed, lost a lot of weight and no muscle tone. The daughter delivered Glory to me in Oneonta, complete with all the supplies and food he will need for a long time: crate, winter coat, large quantities of dog food, harness, lead, toys, complete medical records, heartworm and tick meds, etc) and generously donated $150.00 to us as a thank you for taking him in to NEBTR. The daughter was crying when she surrendered him, wanted to keep him if it were possible, but she has two children, a third on the way, and rescue dogs of her own. Glory's two standard poodle brothers have been taken in by a poodle rescue organization. I've promised to keep her updated re his health and placement. 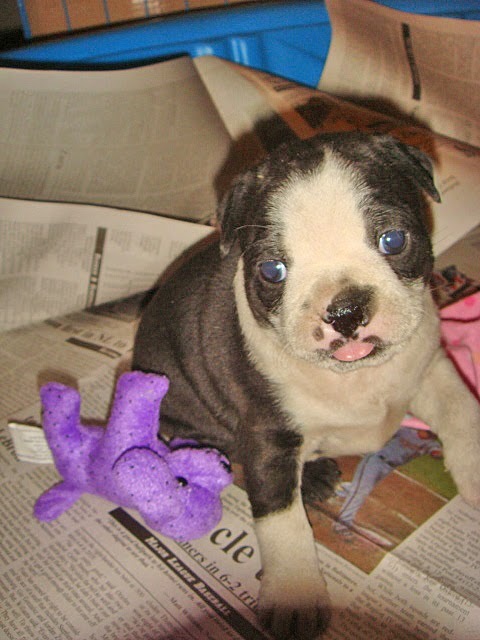 Glory 's left eye was removed at birth, congenital deformity; the breeder wanted to put him down, but his mom, Jane, agreed to adopt him, both mother and daughter are animal rescuers. Glory seem like a sweet boy,is getting along fairly well with my little spoiled princess, Abigail. He is sleeping a lot and relaxing, no more kennel stress, and even played with Abigail a bit today, great to see them both running around the house together. Glory went for his vet check today, is in good health overall. He has some weakness in his rear, we are not sure if that is from muscular atrophy due to lack of exercise or structural issues. We did a check for Lyme disease just in case, he came out OK. He did not react to the other dogs and cats at my vet, always a positive sign. Glory weighed in at 16.5 lbs, should probably be eight to ten more pounds, given his size, so I am letting him eat however much he wants. Hoping to walk a few miles a day with him to improve his muscle tone and increase his appetite if the weather cooperates. Glory is settling in quite well, quiet, non-barker, not destructive, gets along with Abigail. 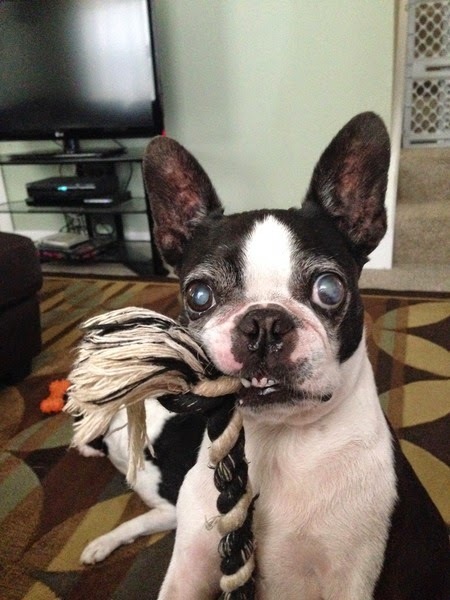 He's going to make someone a good companion, if adopters are not put off by the absence of his eye. Doesn't bother me, but some people may not look past this slight imperfection to the sweet guy behind it. I'm SO glad he's in your very capable, loving care, Jeanne! Welcome, Glory. You are in another pair of good hands....the closest to your Momma's. I just wanted to share an update on Milo. 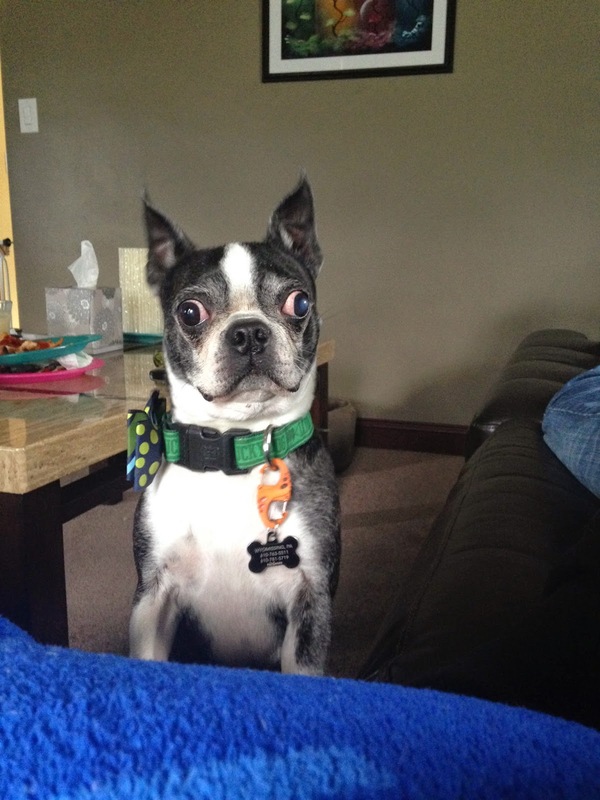 He was adopted to a great family with a Boston brother, Toby. They are having a blast in the summer and soaking up the sun. It turns out that Milo does not love the pool as much as Toby. You can see in the pictures that Milo has filled out and looks amazing! He had to get a new collar! The pictures are adorable! He is a super lucky dog! Lacey, Presents and Thanks to All of You!